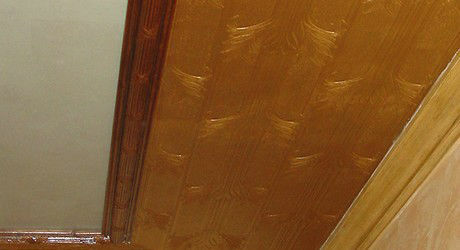 Lincrusta was invented in 1877, and soon became popular because of its beauty, durability, and washability. Some ten years later, Anaglypta, a lighter paper, became particularly popular for dadoes and friezes, and used as a general wall covering. Perfect for irregular or damaged plaster walls. If your home, shows significant wall damage, or previous evidence of plaster repair below the chair rail molding, let Urban Revivals restore the look of your home with these spectacular embossed wall coverings. 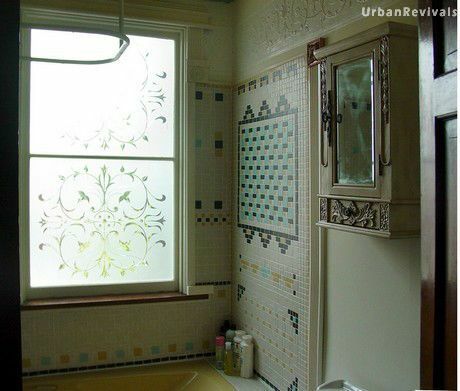 Lincrusta is shown just below the ceiling of this recently renovated bathroom. Urban Revivals can remove old wallpaper, scrape off powdery or flaking paint, and "even out" uneven walls with plaster or lining papers. Lincrusta is generally imported from the United Kingdom. Availability varies by pattern and manufacturer, and prices have risen considerably in the past decade. Lincrusta patterns are now available at Amazon , and may also be available at Outwater Plastics. Anaglypta will not provide the same degree of projection from the wall, but its effect nonetheless is quite appealing. Smaller borders can also be painted and embossed for the look of a frieze in your room. Lincrusta borders are 9 - 12" tall. Analypta papers may be standard wallpaper width or borders are available down to 5" tall. Anaglypta papers may be used for ceiling borders, as shown at left. This pattern, of grass leaves, was cut to fit within a border reminiscent of bamboo, and painted in a metallic gold. Receive Your Free Monthly E-Newsletter! 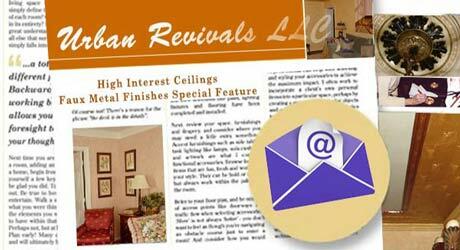 Sign up for the Urban Revivals E-Newsletter! Change your mind? To return to the main page, click outside this form.